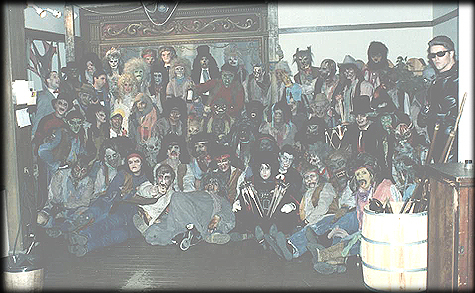 The Haunt monsters put the logging tools to work for this popular theme. This theme went for four years as the log ride motif. The theme was the log ride gone bad. The monsters were dressed as deranged loggers. They were cutting up victims with their saws, chainsaws, and axes. Since this particular attraction lasted so long, it was an obvious crowd-pleaser. Very entertaining. 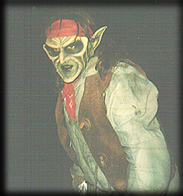 One of the many early alien-type themes the Haunt hosted in years past. Most of the props and costumes can be seen nowadays in “Alien Attack!” The spookiest thing about the attraction is not necessarily the theme, but the building. With the slanted floors and close quarters of the Haunted Shack, a perfect setting is laid out for whatever theme is put inside. 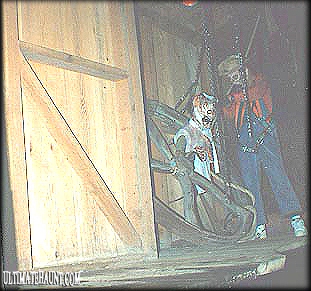 Unfortunately in Novemeber 2000, the Haunted Shack was torn down. All we have left now is some great memories of a wonderful attraction.